I'm going to switch lanes on you and tell you a story that has nothing directly to do with health, but everything to do with the perseverance it takes to accomplish your goals. When it comes to weight loss, you are absolutely right that at this point in time, I would not understand your feelings and the struggles it takes to lose each pound. Sure, I've hit many points in my life where my jeans felt a little too tight and knew I needed to cut down on the take out food, weekend Cinnabon trips, and increase my weekly workouts. However, I've never experience the need to lose 20, 30, or 50 pounds. I do understand those moments when you want to say "F*ck it." and throw in the towel. I do understand the day to day struggle pushing yourself to move forward towards achieving that ultimate goal. I do know a thing or two about the key to ANY success...patience and perseverance. This month, I wanted to take a minute to share my personal story of how I got to where I am today with Evolve Fitness. It all started when I moved to the Big Apple in 2011. After graduating from the University of Central Oklahoma and having danced all my life, it seemed only natural to do what all the other dancers do and move to NYC or LA to see if I can make it. No regrets right?! Well I tried it....and hated it. I discovered that the audition process was horrendous and not for me. What now?! How am I going to make a living? That $750 rent (bills not included) wasn't going to pay itself. I did all the odd jobs you can thing of....worked as a server at Applebees in Times Square (I'm sure you can imagine how fun that was), de-thorned 12,000 roses for Valentine's day, cater-waitered for a catering company, nannied, taught dance.....you name it. I worked my a$$ off! This is not where I saw my life going and needed to come up with something else that would be an improved source of income where I wasn't struggling to pay my bills month to month. I knew a friend who had currently went through a Pilates certification and thought that could be interesting. I thought I'd like Pilates, or Yoga? I didn't know because I've only dabbled in it 2-3 times. But what the hay...let's see what's available. Craiglist of course had all the opportunities! Low and behold....a Pilates work-study ad. Thus the journey began with my mentor, Lawson, at The Lab in Dumbo, Brooklyn. My mentor, Lawson, rocking it out at 50 years old! I started to pay off my tuition by working the 6am shift at the front desk. The subway system slows the trains down 20 minutes a part after a certain time at night. That meant I needed to leave my apartment in Queens by 4am in order to make it in time! After my shift, I'd head out to my other jobs to pay the rent. I wouldn't take any of the NYC experience back. It was a significant time in my life where I gained confidence and learned so much about where I wanted to be in life. I learned to get comfortable with spending time by myself and how to fend for myself. I'm also incredibly grateful for the education I received about the body, posture, and how to use Pilates in other forms of training. Lawson as well as other Lab trainers taught me all that I know! I loved how The Lab not only trained clients in Pilates, but also in weight lifting, interval training, TRX training, and even trampolines! Sound familiar? When I moved back to Oklahoma with only $40 in my pocket, I knew I wanted to work somewhere with the same values where cross-training was a key ingredient. Well, I didn't really find that. I saw a trend where most studios were focused on one training modality. My passion was to do it all! I knew that I had the drive and talent to one day run my own business. How I was going to do that, I had no clue. I definitely didn't have the funds myself. And as much as my parents would have loved to invest in me, they didn't have the money either. One day, a client asked if I would teach her daughter and friends a hip hop class. I said, "Sure!" However, we needed a kid-friendly space to do it. That's when my dear friend, Becky came along. She was one of the moms that offered up her basement for these dance classes and it just so happened she owned another house that was used as a private Pilates studio. No one lived there. Just a house with all the Pilates apparatus in it. Hmmm....interesting! I asked if she would be interested in renting it out. 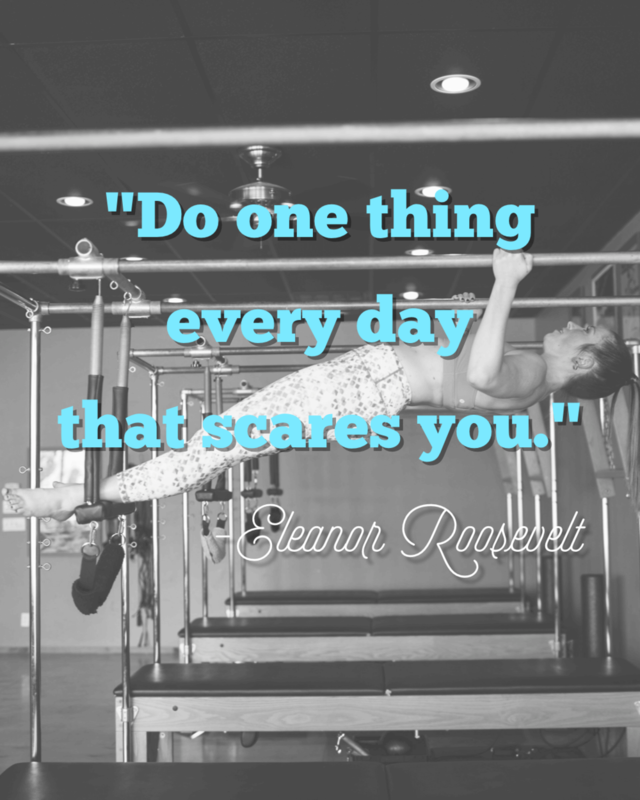 From there, I took the leap and started Evolve Fitness in 2013, training privates and duets out of Becky's Pilates house. As with any start-up business, you can imagine the fears that go along with taking the risk! Are my current clients going to want to follow me? Will I be able to make enough money at first to live on? What if I fail?! If you allow fear to take over, you will literally freeze. I took all the steps I needed to take, identified all of my fears and what could go wrong, and prepared the best I could. After that, sometimes you just have to go for it and see what happens! Everything works itself out. Three years later, my clients and I had out grew the little Pilates house. It was time to find a bigger space. Again, I ran into some setbacks. Where was I going to get the funds to purchase equipment of my own? It ain't cheap! Would I build enough clientele to afford the increased rent? Remember, everything works itself out if you do the work. It just happened that a local Pilates studio was closing and selling their equipment for half the price of new reformers. Now we're talking! The problem still remained, however...how was I going to scrounge up $15 G's within 2 weeks? As majority of this story goes, not only does it help when the right doors open at the right time, but it also helps tremendously when you have an amazing support system. A client was more than happy to loan me the money, and I promised to pay him or her back as fast as possible when I landed a business loan. I purchased the equipment, found somewhere to store them, and now moved onto the next steps which was finding a space and loan. I knew that in order to convince a bank that I was worth the investment, I needed to put a business plan together...to which I procrastinated on for probably a year. Aha! One of my weaknesses! The first step is admitting your problems, and then find help. Back to the wonderful world of Google. I searched for "business workshops", "how to write a business plan", "business coach", etc... I came across Rose State Business Resource Center where they offer FREE business coaching. I met Sandy and knew that this was the missing piece I needed. Yet another powerful woman that I've crossed paths with along this journey. She gave me the tools and resources to put an AMAZING business plan together, and with some help from my Grandma, I was approved through First Liberty Bank. I got the money, found the perfect space in Casady Square, and opened up Evolve Fitness doors in October 2016. In no way did I do it by myself. It's been a team effort, and as you can see, it's been quite the journey! There have been setbacks, there's been failure, and there's been triumph. I still have days when I want to throw in the towel, and think to myself "why are you doing all of this! Is it worth the stress?" Absolutely it is. When a client comes in with their success stories of how they were able to get up and down out of the chair with ease, how they received rave reports from their doctor, or how they were able to fit into jeans they hadn't worn in 2 years, it makes all the struggle and tears worth it. Moral of the story is, when you want to give up, take a look back at all you've accomplished. How far have you come? What are you able to do now that you weren't able to do a year ago? Need help remembering? Phone a friend! I wouldn't have made it this far without the support and advice from family, friends, mentors, coaches, and most importantly....my clients! One push-up, one squat, one meal, one pound, and one day at a time all adds up. YOU are more than worth it. Know that there will be times of failure and days that won't be perfect. There WILL BE more than one wrench thrown in your way. Nothing is perfect! All you can ask of yourself is to show up, be present, and do your best. With a little help (a lot of help) from your friends, the rest of your story will come together!